Veracruz is known as a city with a warm welcoming atmosphere, and afro-Caribbean rhythms. The port city has a long and interesting history and a vibrant culture, with plenty of diversions for visitors. From strolling the Malecón to visiting nearby ruins and UNESCO World Heritage sites, you'll find plenty to see and do in Veracruz. Here are our favorite pastimes in this colorful city. The people of Veracruz, called "jarochos," are lively and friendly, and the culture here is both laid-back and festive. The main square of the Port of Veracruz, called the Zocalo or Plaza de Armas, is the main social center of the city. Start your day here with a breakfast served at one of the many outdoor cafes and restaurants, or end the day to the sound of marimba music or dancing to danzón, a unique combination of Cuban rhythms and ballroom dancing. Veracruz port's Malecon, or boardwalk, is a relaxing place to stroll. You can people-watch, see street performers or shop for souvenirs. There is a crafts market where you can purchase some of the traditional handicrafts, such as a hammock or a guayabera (tropical shirt). On your walk you can also get a glimpse at the workings of Mexico's largest port as you pass by cargo and military ships. A variety of double-decker sightseeing buses depart from here for city tours, including "El Piojito," and the Turibus. Besides offering educational displays and shows, the largest aquarium in Latin America also serves as a marine research center. The aquarium houses a wide variety of sea life from the Gulf region, as well as from other parts of the world. Here you can see barracudas, nurse sharks, giant manta rays, sea turtles, and manatees. Visitors can also participate in swim with dolphins and shark feeding activities. The Acuario de Veracruz is open Monday to Thursday from 10 am to 7 pm, and Friday to Sunday from 10 am to 7:30 pm. The city streets of Veracruz are lined with sidewalk cafes and bars. The oldest cafe is Cafe La Parroquia, which has been a Veracruz institution for over two hundred years. The specialty here is "lechero," coffee served with milk. Your waiter will bring you a glass on a saucer, filled one third of the way with strong black coffee. Bang on your glass with a spoon to signal another waiter who will bring a metal kettle to fill your glass to the rim with hot milk, elevating the pot as he pours in a thin stream, creating a nice layer of foam on your coffee. Delicious! The Santiago Bulwark was built in 1635 and now is the only visible remnant of the defensive wall that once surrounded the port city. Go inside to the museum where you can view “Las Joyas del Pescador” (the Jewels of the Fisherman), an exhibit of prehispanic jewelry and weapons. This remnant from Veracruz' past is located on Calle Canal between Avenida Gomez Farías and 16 de Septiembre. Open Tuesday through Sunday from 9 am to 5 pm, closed Mondays. The food from Veracruz state is one of the most distinctive of Mexico's varied cuisines. Seafood and spices are the hallmark of this rich culinary tradition. Huachinango a la veracruzana, red snapper prepared in a spicy tomato sauce, is one of the specialties to try, along with arroz a la tumbada, a rice dish baked with seafood, and caldo de mariscos, a seafood stew which is said to be a great hangover remedy. The fortress of San Juan de Ulúa is one of Veracruz city's most important landmarks. The fortress is on Isla Gallega, a small island in the harbor, and formed part of the fortifications that protected the city against pirates. Construction began in the mid-1500s, and it was later expanded. For hundreds of years San Juan de Ulúa served as the primary military stronghold of the Spanish Empire in the Americas. It was also used to store products that were to be shipped to Spain. After Mexico gained its independence it was used as a military base and a prison. The ramparts, dungeon and barracks are now open to visitors. Although Veracruz is not among Mexico's most popular beach destinations, the beaches of Veracruz certainly offer a great way to find relief from the heat in this tropical city. The Villa del Mar beach is within walking distance from the aquarium, and there is also a decent beach in Boca del Río (a new suburb of Veracruz). Slightly farther away, you can also check out the beaches at Punta Mocambo, or farther south, Punta Antón Lizardo. This is a great spot to begin exploring the Veracruz Reef System. This UNESCO-listed city has elegant colonial-period architecture and a slow pace. It makes for a long, but do-able day trip from Veracruz (about two hours drive each way). While there, visit the Nuestra Señora de la Candelaria church, dedicated to the town's patron saint (celebrated on February 2nd, Día de la Candelaria), take a boat tour on the Papaloapan river, and visit the Casa Museo Agustin Lara, dedicated to one of Mexico's most beloved singer-songwriters. Cempoala (sometimes spelled Zempoala), is an archaeological site located 27 miles north of Veracruz port. 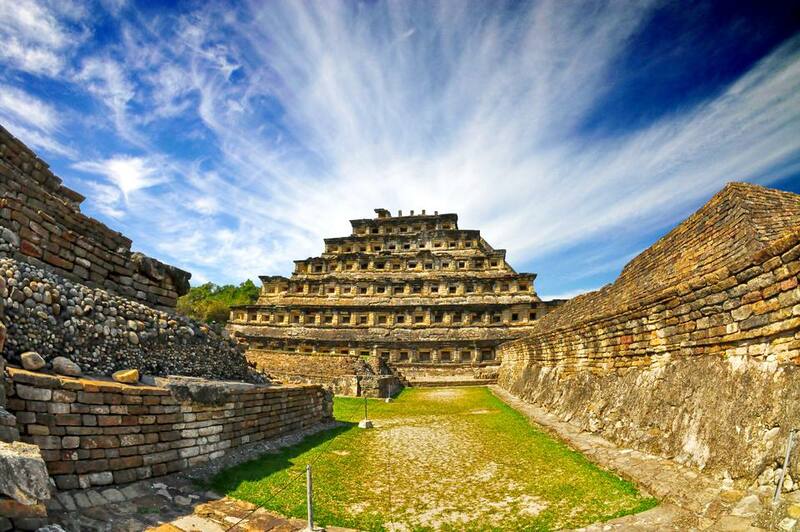 This was the capital of the Totonac civilization at the time of the arrival of the Spaniards. It was the first city that Hernan Cortes and his men visited in Mesoamerica.